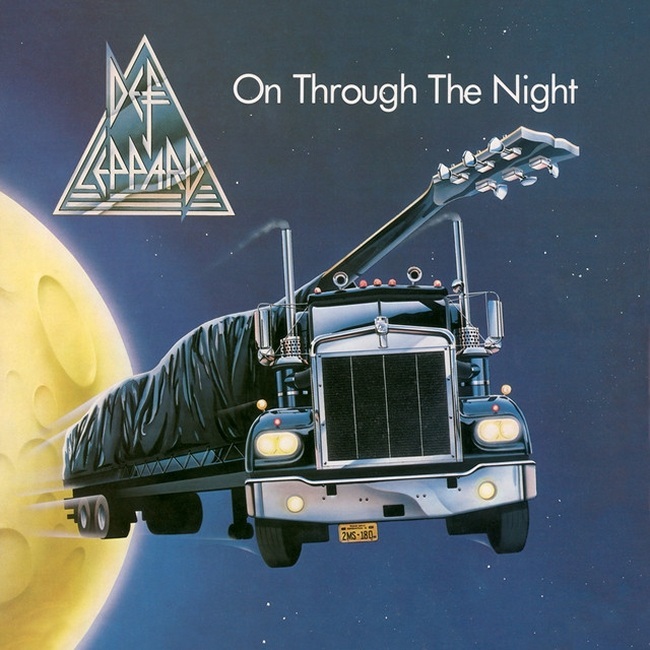 Def Leppard released their debut album On Through The Night 37 years ago today on 14th March 1980 in the UK. The album was then released in the USA/Canada on 26th March. It had been recorded at Startling Studios in Tittenhurst Park, Ascot, England. A country home owned by ex Beatles drummer Ringo Starr which was featured in John Lennon's 'Imagine' promo video. The estate is located between the Ascot Racecourse to the West and the Thorpe Park Resort to the East. Just under 30 miles to the South West of central London and only 15 miles from Reading where they would play a festival show in August 1980. The band partied and messed around on motorbikes in the grounds of the large estate which even contained a life-size Dinosaur statue. This was captured in photos later used for the High 'n' Dry album's inner sleeve. The album released was preceded by the first single 'Hello America' which almost became their first Top 40 hit in the UK. The album peaked at Number 15 in the UK chart and would spend 8 weeks in the Top 100 from late March to early May. 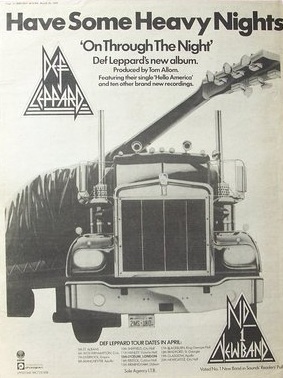 It was produced by Tom Allom who had previously worked with Judas Priest. The band had initially wanted to work with Mutt Lange but would have to wait until album number two. The On Through The Night world tour started in early April with their first major UK headline shows following a two month warm-up tour in January/February. They would them head to the USA before returning to the UK and Europe. Read some of the band's thoughts on this album from various sources between October 1988 to 2011. Steve Clark - "We recorded the first album at Startling Studios, which is owned by Ringo Starr in Ascot. And we had a real lot of fun making that record. That's why it sounds like it does." Rick Savage - "It's a vague memory doing the record because it was the first time. It's like 'so this is what it's like to be in the music business' sort of thing." Rick Allen - "I think we drank far too much." Rick Savage - "We used to get drunk every night and still try and record. And it's like totally young kids playing at being musicians and I think that's how it sounded to me." "You know, that first record, Tom Allom produced it, God bless him. Lovely guy and a good producer. But I think his instructions from the record label must have been something like, "Just capture the band's energy, man." We'd been playing most of those songs live for 18 months. So, if anybody came along and suggested we change them in any which way, we wouldn't have been able to. We'd lived with them for so long. We just had to leave them as they were and record them as best we could. Because we knew the songs so well, we had the backing tracks down in a day. And then we spent three weeks ruining that record by doing way too many overdubs. That was the thing that we had a struggle with. It was us trying to find our way. You know, a lot of people got a great affection for that record, but as I always say, "Yeah, but it's hardly the first Van Halen or Boston album, is it?" "The one good thing about it was it gave us a launch pad to get better from. And I believe that when we got to High 'N' Dry and on to Pyromania and Hysteria, we started doing the record the first album should have been. We couldn't get Mutt [Lange] to do the first album, he wasn't available. It was fun working with Tom, but we spent most of the time drinking wine and having a good time as opposed to making a good record. I didn't really always enjoy making albums with Mutt, but I certainly enjoyed listening to them afterwards. But it's the other way around with On Through The Night." "It's a bit naive and it could have been a better record. I would love the opportunity to take it in the studio and remix it. Sadly, the house where we recorded it, which used to be John Lennon's place in Ascot, got bought by some billionaire Arab guy. He took all the master tapes - which would have been in one of the rooms of the studio - into their outdoor pool, and filled it in with earth and put a garden over the top of them. They're lost forever." "If you play the four albums back to back, you can definitely hear a progression. On the first album, On Through The Night, you hear the ideas executed very badly. On the second album, High N' Dry, you hear us getting a lot heavier but the album is very tightly recorded. The third album, Pyromania, is where we came into our own--we had the ideas, the harmonies and the arrangements of the first album, plus tightness of the third album. With Hysteria, we took it one step further." "When Pete Willis was in the band in the early days, he was listening to a lot of Pat Travers and Judas Priest, which is where the very heavy stuff came in. Steve (Clark), our main writer, was more into Zeppelin. Sav (Rick Savage) was a big Queen fan. And I was very into the glam stuff. I like Mott The Hoople, Alice Cooper, Sweet and Slade." "The band was very tight and it was easy to get good performances out of them. They had no fear of the studio and because I was quite a bit older than them (they were very young at the time) I think they looked on me as a kind of father figure! It was them that nicknamed me The Colonel."